Several of Wednesday's newspaper front pages lead with Brexit, ahead of an EU summit in Brussels later where Theresa May will make her case for a delay until 30 June. "Will we ever escape EU clutches?" is the despairing headline on the front page of the Daily Express - alongside a photograph of the French President Emmanuel Macron embracing Mrs May warmly in Paris. 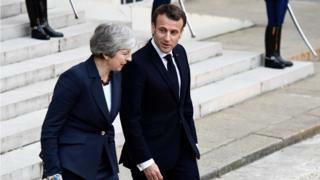 The i newspaper says EU leaders are set to rebuff Mrs May and insist on a long delay to Brexit, while the Guardian says the prime minister's hopes of leaving soon have been "dashed". The Times hopes that EU leaders will take the risk of offering Britain a long delay - warning that the fallout from a chaotic no deal would be far worse that the destabilising effect of continued uncertainty. The Daily Mail blames "inept" MPs for the "humiliating" prospect of "another year in limbo". It says members of the political class have undermined Mrs May in her honest bid to secure an honourable Brexit and are guilty of hypocrisy and betrayal. Meanwhile, the Daily Telegraph says many senior Tories believe a long Brexit extension will make Mrs May's tenure unsustainable. It says the party may change the rules to remove her if she doesn't resign. In its editorial comment, the paper says that "rather than wait to be toppled" the prime minister should set out the timetable for her departure so that a replacement leader can be chosen as soon as possible". The Telegraph and the Times report that firefighters in Devon and Somerset have trained as special constables and been given powers of arrest in an attempt to boost the number of police officers. Seven have qualified under the pilot scheme and will be known as "community responders". The Fire Brigades Union says it will erode public trust in the fire service. But the local police commissioner says the responders will be a great addition to rural communities. Meanwhile, 10 years after the expenses scandal, the Daily Mirror has been totting up how much MPs have made from selling homes that were partly-paid for by taxpayers. It estimates that 160 of them shared profits of £42m - with some making £1m each. Under parliamentary rules the MPs are allowed to keep the money, but the former chairman of the Committee on Standards in Public Life, Sir Alistair Graham, tells the paper they should repay any profit they made. The Sun claims the government's own research suggests that its plan to ban adverts for junk food before 9pm will cut just two calories a day from children's diets - the equivalent of less than half a Smartie. The paper accuses ministers of surrendering to "middle class public health zealots who spend their lives tut-tutting at working people's grub". In another story, the Sun reports that Elvis Presley's mansion Graceland, could be dismantled and rebuilt in Japan, the Middle East or China because of a dispute about the future of the site. Elvis Presley Enterprises, which operates the singer's home as a tourist attraction, is unhappy that Memphis City Council is refusing to pay for a new 6,000-seat indoor arena. Its managing director says he's received generous offers to move the building abroad. According to the Financial Times, Sir Paul McCartney has weighed into a row about funding for the Liverpool Institute of Performing Arts. The former Beatle helped raise £18m to open the college on the site of his old school in 1996. It has lost hundreds of thousands of pounds a year in state funding because of policy changes that critics say favour bigger institutions. Sir Paul says the college is his "passion" and part of his legacy and he has called on the government to intervene. Six months after the murder of the journalist, Jamal Khashoggi, at the Saudi consulate in Istanbul, the Financial Times sees signs that banks and investors are prepared to draw a line under the killing. News of his murder sparked international outrage at the time and business leaders boycotted a conference in Riyadh. But the state-backed oil company, Saudi Aramco, is now poised to raise $12bn in its first international bond sale - after attracting $100bn dollars in orders. And several papers report the birth in Sweden of the first baby to be delivered from a donated womb which was transplanted using robot-assisted keyhole surgery. The new technique is said to be less dangerous for donor than traditional surgery. The womb came from the baby's grandmother. One surgeon tells the Telegraph that the delivery of such a special, longed-for child was "simply wonderful".